주역천견록(周易淺見錄)은 조선 세종 때 유학의 대가인 양촌 권근(1352∼1409)이 지은 목판본으로, 그는『양촌집』이외에『입학도설』,『오경천견록』을 지었다. 권근은 공민왕 17년(1368) 과거에 합격한 후 여러 관직을 거쳤으며, 조선을 개국하는데 공이 커 개국공신에 봉해졌다. 인쇄판의 양식은 매우 고형으로 행간에 계선(界線:투영도에서 정면과 평면과의 경계를 나타내는 횡선)이 없고, 글씨체는 고려시대의 간본에서 많이 볼 수 있는 구양순체에 가깝다. 또한 서문과 발문이 없고, 다만 권마다『주역천견록』이라는 표제 다음줄에 ‘양촌후학권근저’라고 하고 있고, 다음에 첫권은 「역설상경」, 둘째권은 「역설하경」, 끝권에는 「역설계사」로 표시하였다. 처음에는 한 권으로 되어 있던 것을 소장자가 3권으로 나누어 놓았다. 『주역천견록』은 권근의 성리학적 사상을 짐작할 수 있는 자료로 보인다. This is a woodblock-printed copy of Juyeok cheongyeollok by Gwon Geun (pen-name: Yangchon, 1352-1409), an illustrious Confucian scholar who lived in King Sejong’s reign. Works by Yangchon Gwon Geun include Yangchonjip (‘Collection of Writings by Yangchon’), Iphak doseol (Diagrammatic Treatises for the Commencement of Learning) and Ogyeong cheongyeollok (‘Shallow Views on the Five Classics’). Gwon Geun successfully passed the civil service examination in 1368 (17th year of King Gongmin’s reign of Goryeo) and, thereafter, occupied several government offices. After the founding of Joseon, he was bestowed upon the title of Gaegukgongsin for his contributions toward the creation of the new kingdom. The woodblocks used for printing this book appear quite obsolete in style. There are no dividers between the lines, and the characters are close in appearance to Gu Yang-sun (Ouyang Xun)-style characters that were frequently seen in Goryeo-period printed books. The book has no preface or postscript. 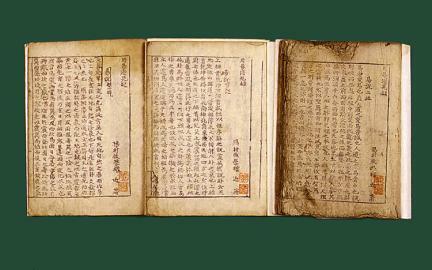 Each of the three volumes has a cover page indicating the title “Juyeok cheongyeollok” and the name of the author “Yangchon huhak Gwon Geun jeo [By the humble scholar Yangchon Gwon Geun]” written below it. This is followed by the volume title “Yeokseol sanggyeong” in the first volume, “Yeokseol hagyeong” in the second” and “Yeolseol gyesa” in the third. The book, originally a single volume, was divided into three by the owner of this copy. Juyeok cheongyeollok offers insights into the Neo-Confucian thinking of Gwon Geun.